1. Magnetism- Can a magnet work through plastic? What happens when you add water? 2. Static Electricity- Tear pieces of tissue paper and styrofoam. Then, rub the bottle on wool, your head, or the carpet. What happens? 4. Bubbles- Mix up 1/2 cup water, drop of dish detergent, and food coloring. Shake, what happened? 5. Mud- Can water and dirt make mud? (1/2 cup dirt, 2/3 full with water) Classify the water and the mud. 7. Numbers- Roll the dice and find the sum of the 2 numbers. 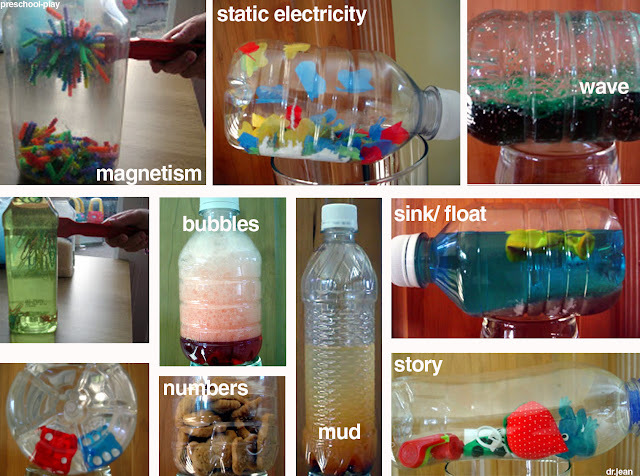 Estimate how many objects are in the bottle. 8. Story- Put objects in a bottle and create a story from them! visit Dr. Jean for more bottle ideas!